Read about our real life volunteer experiences from the Book Bus in Zambia. Librarian, Adrian Thompson volunteered in Zambia in 2017, his 4th time with the Book Bus. “The Book Bus team make the whole experience of volunteering work brilliantly, with their organisational skills, knowledge of the local area, and of the Zambian education system. There is a real exchange going on, sharing ideas from volunteers who join the project,“ said Adrian. Adrian spoke positively about the way volunteers worked as partners with local teachers, and the Book Bus team sharing skills and ideas that can be used to develop engaging reading sessions for children in the future. Toby and Sabine are a son and mum team who volunteered with the Book Bus in Livingstone during 2017. Aged nine, Toby was one of our youngest volunteers and his enthusiasm for reading was something he was able to share with the children he met. He particularly enjoyed the one-to-one reading sessions: “It was great sitting down and reading with children of a similar age to me. 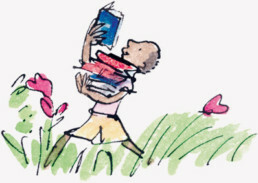 I was amazed at how eager the children were to learn how to read, “ said Toby. Volunteering as a family was something both Sabine and Toby wanted to try, “Spending quality time together in such a different environment, and working together, a little out of everyone’s comfort zone, can lead to families learning a lot about each other,” concluded Sabine. 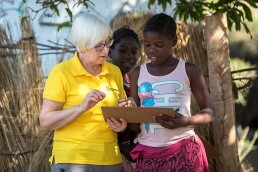 Having spent her life in the world of books, recently librarian retiree, Carol Williams joined us for lots of bookish fun as a reading volunteer in Zambia. “I had heard about the Book Bus several years ago,” explained Carol “and having recently retired, I decided it give it a go. 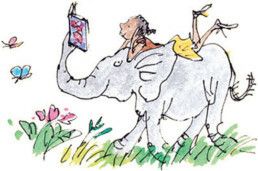 The charity’s aim is ‘to improve child literacy rates by providing children with books and the inspiration to read them’, and volunteers, working alongside Book Bus staff, are the key to making this happen. I felt that my skills from years as a school librarian would be a good fit. 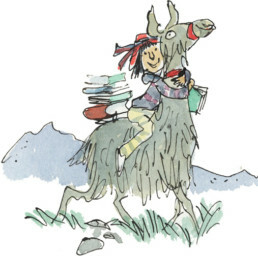 “On a typical day we would be up early for breakfast at 7am, and travel in Book Bus Charlie (mobile library) to start work in school at 9am, running two reading sessions with groups of children. The school might be in a suburb of Livingstone, or more rural, in which case we might pass zebra, elephants and impala en route. Very exciting! There are 72 languages spoken in Zambia, but English is the key to getting on, so we mostly use picture books in English with one of the Book Bus Zambian team on hand to help with translate when necessary. The afternoons were a mix of preparation for the next day and visiting local libraries to offer one-to-one reading sessions,” Carol continued. “My lasting impressions from the trip are all to do with the people. Inspirational adults have set up and run local schools in deprived areas. Enthusiastic children keen to learn is a bit of a cliché, but it was so true as they put their all into the work they did. The Book Bus is obviously well respected, making a real impact in Zambia. Try it and surprise yourself! ” Carol concluded. I would recommend the Book Bus experience to anyone. An incredible experience as you contribute to existing reading programmes that really do make a difference. It's unique and fun. Volunteers are valued and appreciated. The experience was challenging, eye-opening but above all deeply rewarding.